Going through a divorce can be intensely draining and, at times, emotion can cloud judgment. 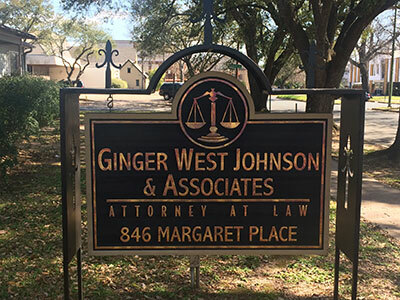 The Law Offices of Ginger West Johnson is focused on providing comprehensive divorce litigation services that take into account your best interests as well as those of your children. There are many intricacies of Louisiana divorce law, and as a longtime in-state divorce attorney, Ginger is well-versed in all of them. If you’ve been a resident of Louisiana for at least one year, you may file for divorce in the state of Louisiana. The state will recognize both fault and no-fault divorces, as well as those requested because one spouse lives separately from the other for a period of at least six months. If the two of you share children, this period increases to one year. At the Law Offices of Ginger West Johnson, our qualified divorce attorney will work hard to help you and your spouse finalize agreements related to these issues with the hope that the divorce won’t be contested. Louisiana is a community property state, which means that all assets or property acquired throughout the marriage are considered the property of both parties. In some situations, this means assets are evenly divided 50/50, but this isn’t always the case. Our divorce lawyer will utilize her knowledge of the state’s property-division laws in an attempt to distribute community property fairly and seamlessly. If you are considering legal separation, are in need of information about how to file for divorce or are in search of a criminal defense attorney, contact the Law Offices of Ginger West Johnson. We serve Shreveport, Bossier City, Minden, Mansfield, Homer, Haynesville and Coushatta, so call us at 318-734-9905.